Honey Dew Melon Sage - Small heart shaped green leaves have a wonderful fruity scent similar to honeydew melon. Can be used in salads, desserts, fruit drinks, jellies, etc. 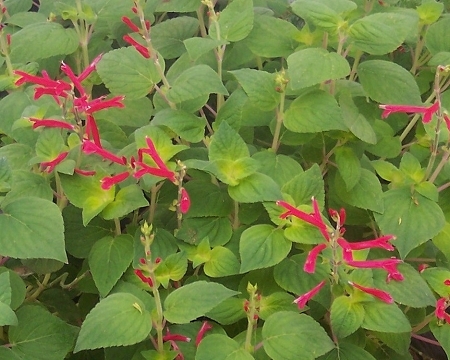 Long bright red flower spikes draw hummingbirds to the garden and are also edible. Perennial zones 9-10. Live starter plant in 3 inch container.